As the impossibly old guardian of the Pillar of Death, it takes more than a Death Star at point-blank range to kill Mortanius, he is simply that hard. Surviving the Death Star-Clone Army-Turelzevir debacle, Mortanius eventually met up with the young Kain, who had been sent back in time on his commandeered Imperial Sarafan Destroyer. Mortanius guided Kain into using his abilities well, and instilled a sense of duty and balance in him, training him to be a proper Pillar Guardian. When Kain discovers that Umah has been resurrected, he asks Mortanius to come with him on his mission of rescue. 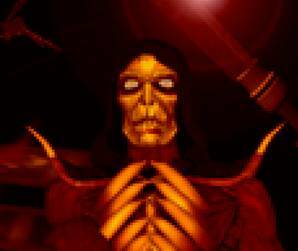 Mortanius reluctantly agrees, and joins Kain and a group of others as they break into the Super Sarafan Destroyer. On the way, Kain explains of Nosgoth’s future and the Sarafan Lord. 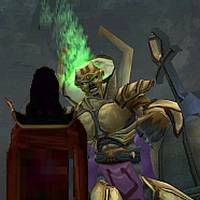 Mortanius astonishes Kain by divulging that his father and the necromancer were once friends, that Kain's Coorhagen family were only adoptive parents, that his real father was once too a Guardian of the Pillars. He goes on to reveal that the Sarafan Lord was a former pupil of his, taken by the Dark Forces and made into one of their own. He betrayed and murdered Kain's father. Kain is furious, but the old man advises him to control his emotions. The could be made to serve the Vamperor. As the rescue mission proceeds less successfully than planned, the Sarafan Lord confronts Mortanius, declaring that “The Circle is Now Obsolete”. Mortanius, brandishing an old wooden staff defends himself well as the Dark Lord of the Sarafan attacks with his glyph-enhanced blade. All of a sudden, Mortanius stops defending, to the surprise of his opponent. Kain watches in horror as his new mentor stands defenceless. Mortanius’ fate seems sealed, but if the necromancer has taught us anything, it is that in Nosgoth, death is never what it appears to be.